He weighs less than five pounds, but Zazu had big belly problems when he was rescued off the Isle of Palms coast nearly three months ago. The tiny, green sea turtle had eaten plastic, all kinds of plastic; part of a balloon, clear sheets of plastic and material from a grocery bag. The juvenile turtle is the 23rd patient admitted to the South Carolina Aquarium’s sea turtle hospital because of sea debris. He swims in a private tank next to 17 others now in recovery, including a 260 pound loggerhead named Voldemort who got caught up in crab traps nearly a year ago. What is happening in the ocean when it comes to plastic? Scientists say anywhere from 5 to 12 million tons of plastic are swept into the sea each year. 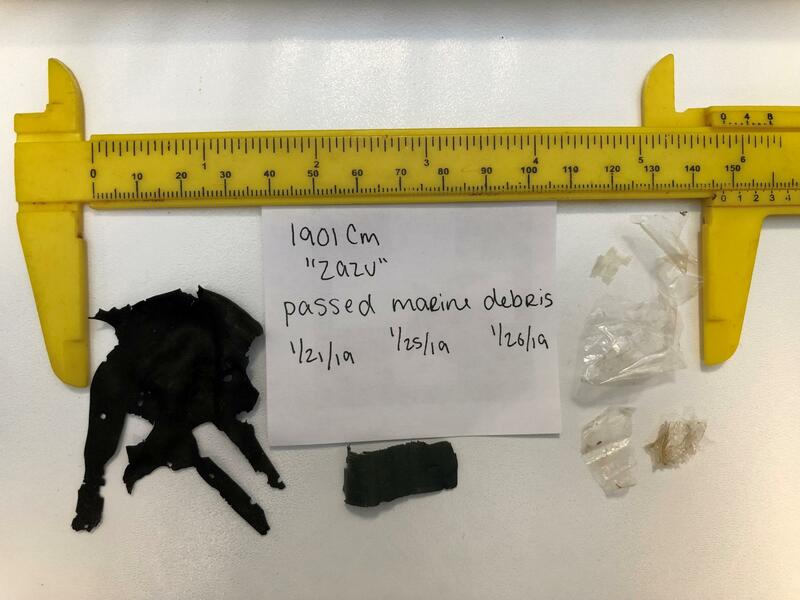 Some are large, identifiable chunks of plastic. Others are microplastics, so small they can’t be seen with the naked eye. It’s believed by 2050, there will be more plastic in the ocean than fish. What’s more, millions of marine animals worldwide are killed each year, including seabirds, because of plastic. They either ingest it, as Zazu did or become entangled as those crab traps caught big Voldemort. 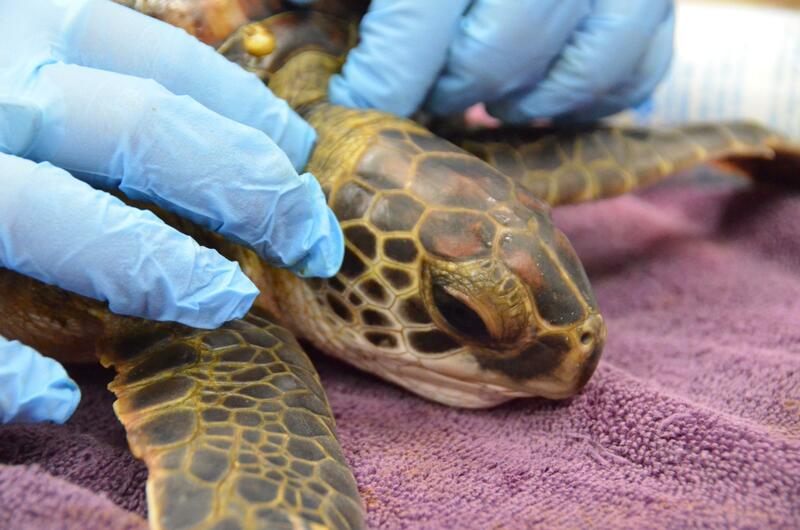 Behind the scenes at the sea turtle hospital at the South Carolina Aquarium and their efforts to track plastic trash. So the aquarium started an education campaign. Sea turtles that require quiet for recovery still get it. Only now, an interactive exhibit allows visitors to peer into the recovery center without disturbing them. Children and adults are both fascinated and saddened. This up close view of an otherwise mysterious sea creature is due in part to man-made hazards. The turtles have become a kind of poster child in the fight against plastic. “It is really powerful to know what is trashing our communities,” says aquarium volunteer Linda Rowe. At least once a week, she meets Howard Hogue at the sea turtle statue near the county park on the Isle Palms. Together, they collect and track trash using an app the aquarium offers for anyone to download. 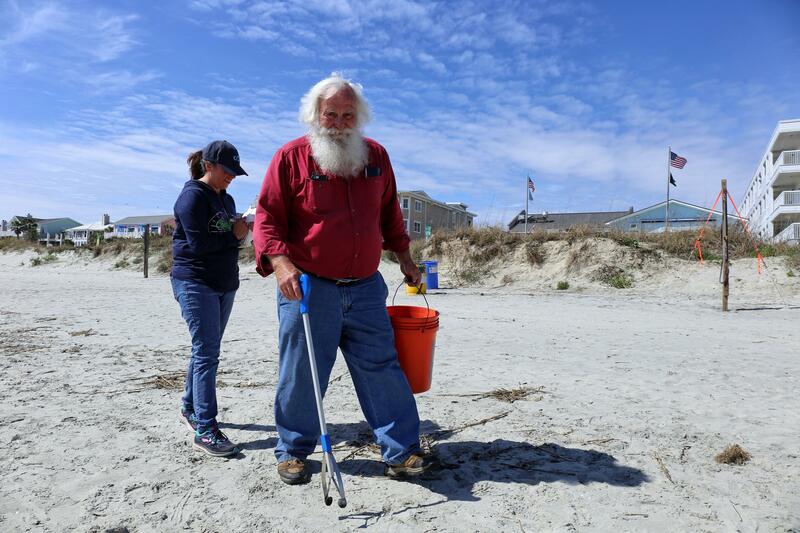 Howard Hogue known as, "Beach Santa" and Linda Rowe pick up litter on the Isle of Palms. “Many days I fill my five gallon bucket four or five times,” says Hogue, who’s already picked up 500 pieces of litter in his Moncks Corner neighborhood 30 miles inland before meeting Rowe. The 68 year-old is dressed in red with a long beard, blue eyes and glasses that slip down his nose. As he walks toward the beach, bucket and grabber in hand, a woman collecting money from parking kiosks screams his name. “Hey, beach Santa,” she says. “It's good to see you." Hogue is well known in the community. He fills his naughty bucket with every kind of imaginable trash. “It’s a zip tie,” he tells Rowe as she quickly makes a list of the items they’ve found. 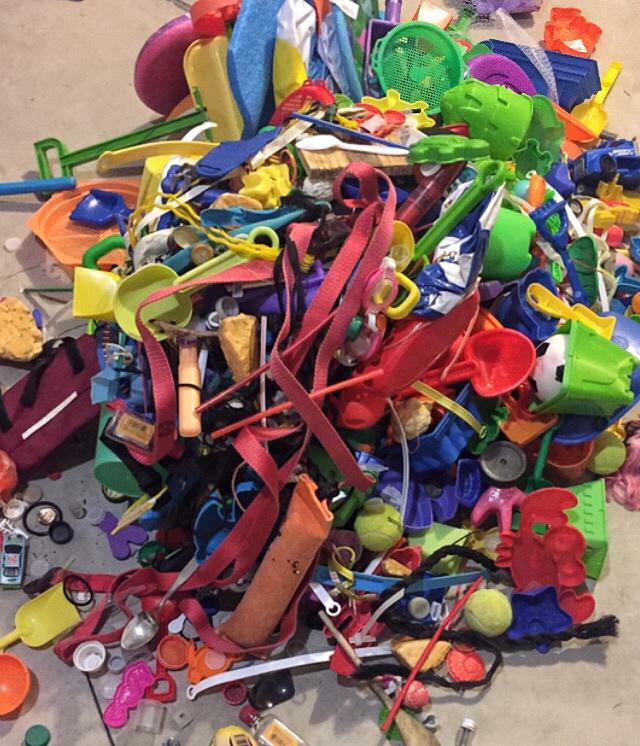 Together, they’ve picked up hundreds of discarded plastic toys; buckets, shovels and nets. All are potential death traps for wildlife. They’ve also gathered thousands of cigarrette butts, which by the way, are filled with plastic and toxic chemicals. Hogue and Rowe estimate he’s collected 30 thousand pieces of trash since they began working together last summer. The aquarium’s app shows 360,000 pieces of litter tracked since 2016. Nearly 70 percent was plastic. Just around the corner, Isle of Palms mayor Jimmy Carroll remembers the families who came to town council nearly four years ago worried about sea turtles. They wanted a ban on single use plastic grocery store style bags, the kind that look like a delicious jelly fish to sea turtles. “It was an easy decision,” says Carroll. Nearly a dozen coastal communities have banned single use plastics like bags, straws and cups. 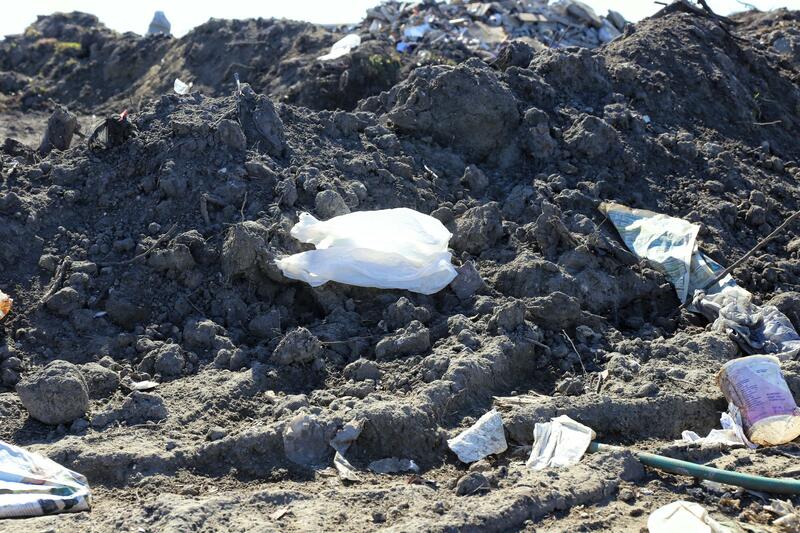 Scientists believe they can take hundreds of years to decompose. They’re also lightweight and are easily scattered. Carroll is passionate and ready for a fight. He’s headed to Columbia to protect the plastic bans local communities are pursuing. State lawmakers and Lowcountry leaders debate plastic bans as local kids form an activist group. Two upstate senators have introduced a measure giving the General Assembly the power to ban plastic containers, not municipalities. A similar measure failed last year. This one not only prohibits future bans, but takes back those already enacted. “I don’t think any municipality should have the power to ban any consumer good period,” explains Republican Senator Wes Climer of York County. 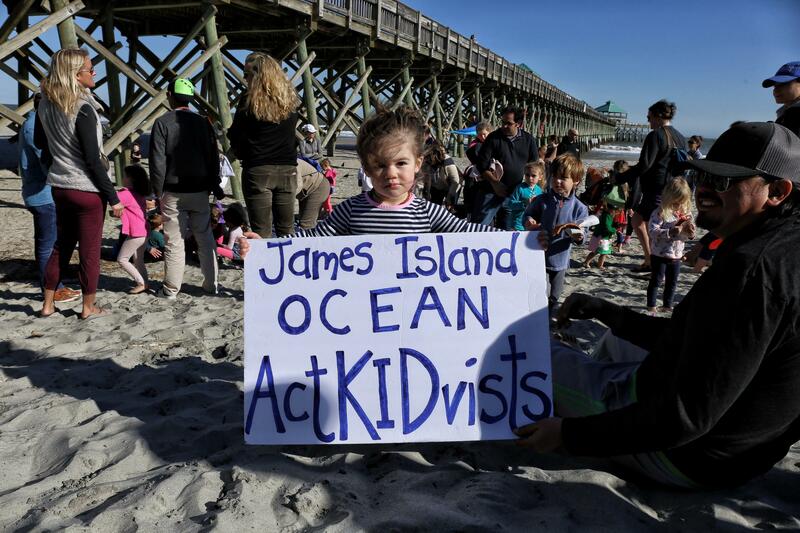 On Folly Beach, dozens of kids are picking up trash as part of a clean-up organized by the James Island Ocean Actkidvists. Founded by Betty and Louis Henderson and Makena and Liam Ryan, the group was inspired by a trip to the South Carolina Aquarium and its ambassador turtles. “When we get older, we don’t want to live in a disgusting place like it kind of is now,” says 9 year-old Makena Ryan. The kids have spoken at city council meetings in favor of single use plastic bans and they make Youtube videos demonstrating how to use less plastic when packing lunches. Their mother Lindsey Henderson is proud. But she’s also worried. How does she tell them about the ban on plastic bans adults are now considering? Dr. John Weinstein, the chair of the biology department at the Citadel, says much of his research about plastics has been student driven. He was finishing a project about the impact of oil spills when cadets expressed an interest in plastic trash. “It was about five years ago, when the great Pacific garbage patch was in the news just about every day,” he says. They decided to track plastic trash in the Charleston Harbor by teaming up with a local beach sweep. What they found was more than 7 tons of plastic debris along the shore, mostly single use plastics like bags, straws and cups. Their latest project teams them up with other schools to look at the impact of microplastics on oysters and ultimately humans. Dr. Weinstein says when plastics begin to break down; they become brittle and flake off as they sit out in the environment. 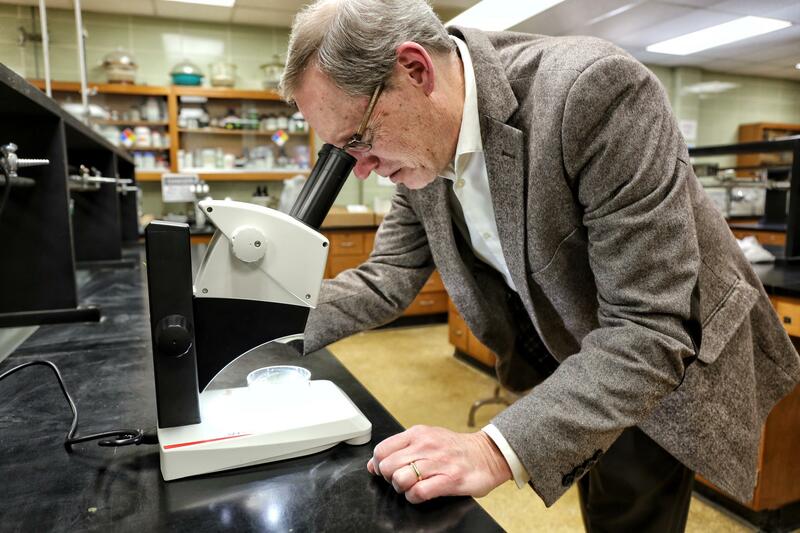 These microplastics, he says, are in our rivers, lakes and oceans by the trillions, even outnumbering zooplankton. Just as frightening as the numbers, he says, are the toxic chemicals plastics attract, everything from flame retardants to pesticides. So what happens to fish when they ingest these microplastics and what, if anything happens to us when we eat those fish? One possibility is they just pass through us like synthetic fiber. Plastics are inexpensive, convenient and durable. That’s what makes them so desirable. 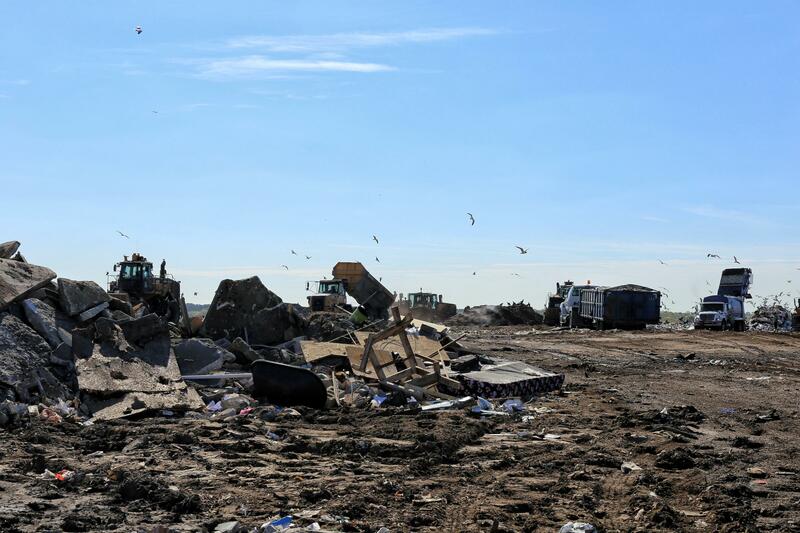 But it’s also what makes them an environmental hazard says Dr. Weinstein. “I’ve heard a lot of people say the plastic problem is so immense there’s nothing I can do to make a change,” says Weinstein. Charleston County recycling coordinator Christina Moskos couldn’t agree more. It’s believed that less than ten percent of plastic trash is actually recycled. “It’s definitely these days not just about recycling, but recycling right,” she says. Moskos admits recycling has gotten more challenging and expensive because clean recyclables are more in demand. But people can help by putting in bins only what can be recycled. That does not include soft plastics, like those single use plastic bags. She says they easily get tangled and clog recycling machines. “When you think about recycling you want to kind of think about reducing and reusing first," says Moskos. How much plastic do you use every day? From opening that carton of eggs to peeling the piece of plastic from beneath the cap of a new orange juice jug, what you hold for just a minute can last a lifetime in the ocean or in a landfill.